Not to be confused with Leeds or Leeds City Region. This article is about Leeds (disambiguation). For other uses, see City of Leeds (disambiguation). Motto: "Pro Rege et Lege" "For King and the law"
The City of Leeds (/liːdz/) is a local government district of West Yorkshire, England, governed by Leeds City Council, with the status of a city and metropolitan borough. 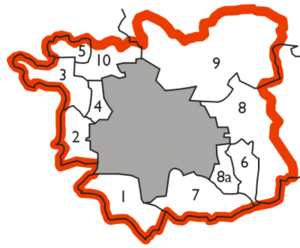 The metropolitan district includes the administrative centre Leeds and the ten towns of Farsley, Garforth, Guiseley, Horsforth, Morley, Otley, Pudsey, Rothwell, Wetherby and Yeadon. It has a population of (2005 est. 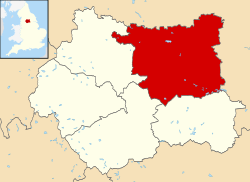 ), making it the second largest local government district in England by population behind Birmingham; it is also the second largest metropolitan district by area behind Doncaster. For its first 12 years the city had a two-tier system of local government; Leeds City Council shared power with the West Yorkshire County Council. Since the Local Government Act 1985 Leeds City Council has effectively been a unitary authority, serving as the sole executive, deliberative and legislative body responsible for local policy, setting council tax, and allocating budget in the city, and is a member of the Leeds City Region Partnership. Thc City of Leeds is divided into 31 civil parishes and a single unparished area. City of Leeds Facts for Kids. Kiddle Encyclopedia.